2000 NORTHWOOD 1467 TILLER! 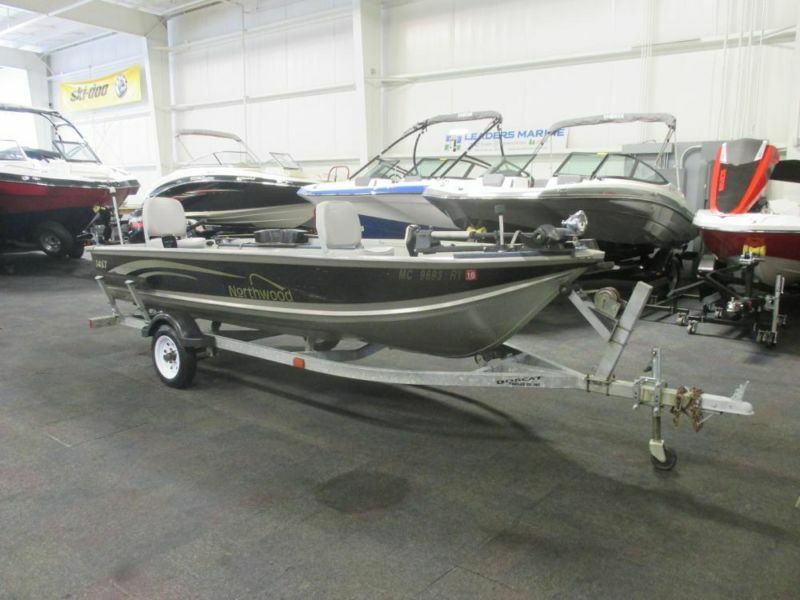 A 15 hp Mercury 4-stroke outboard tiller power this aluminum fishing boat! Features include: Minnkota All Terain 30lb thrust 12 volt trolling motor, bow storage compartment, Humminbird 143 fish/depth finder, bow and stern 25lb Minnkoa Deckhand electric anchor winches, livewell, navigation lights, (2) removable swivel fishing seats w/3 seat bases, rod holders, 3-gallon gas tank, fire extinguisher, marine cranking battery, trolling motor battery, and 4 person carrying capacity. Also included is a galvanized Bobcat bunk trailer including; 12” wheels, side centering bunks, bearing buddies, swivel jack, and tie down straps. This boat is in good overall condition with normal wear. There are minor cosmetic scuffs/scratches on the exterior (see pics/video). It has been inspected by our factory-trained technicians and is mechanically sound. Trades will be considered and delivery is available. Competitive financing rates and terms are also available. Leaders Marine is one of the largest marine and motor sports dealers in the Midwest with over 70,000 sq ft of showroom, parts, and service under one roof located in Kalamazoo, MI. Price is plus sales tax/fees and is subject to change without notice. For more information, please call toll free 866-572-1051. Additional photos and video are available at www.leadersmarine.com.